I love the YouTube plugin, use it daily. I run xbmc on a win7 PC, there are sometimes when it is better for me to still use YouTube in a web-browser, but 1 thing I will say is I love and appreciate the way xbmc shows the vids without the annoying advert overlays! If you press keyboard I on a video, you get the author details, duration. But would it be possible to add the DATE ADDED info? I know asking for the ability to post comments is quite an ask! (tho it would make it such a complete YouTube experience!!) ;-) but maybe I can mod the plugin somehow to let it show the upload date of the video? Using Dharma, the Youtube plugin seems to ignore the aspect ratio defined in the video calibration. The result is that my Youtube video are very streched. The video calibration for my TV makes the pixel aspect ratio at 1.33 (typical for a 1024x768 resolution on a 16:9 AR). This Plugin works almost great for me. Only thing that keeps bugin' me, is YouTub Disco. Each time i'm tryin' to watch a video, i'll get an error saying "Playback failed. HTTP Error 404: Not found". As i'm writing from Germany my first guess was that these contents my be restricted to US users only. This obviously isn't that wrong, as i cant watch those videos in firefox, too. Any ideas appreciated how i can solve this behaviour! liquidoa Wrote: Seems like I was happy too early. PantsOnFire Wrote: I love the YouTube plugin, use it daily. I run xbmc on a win7 PC, there are sometimes when it is better for me to still use YouTube in a web-browser, but 1 thing I will say is I love and appreciate the way xbmc shows the vids without the annoying advert overlays! The upload date should already be visible in the info dialog as part of the descriptions, xbmc's doesn't have a specific place for this info so we included it as the first line of the description instead. eistee Wrote: This Plugin works almost great for me. Only thing that keeps bugin' me, is YouTub Disco. Hmm videos that you can't see shouldn't be showing up as we try to filter such items out. patrickd Wrote: Using Dharma, the Youtube plugin seems to ignore the aspect ratio defined in the video calibration. The result is that my Youtube video are very streched. Hi Patrick, this would seem to be an xbmc issue as the plugin doesn't control video playback it just servers up an url. Please post in the general support forums about the problem, or create a trac. The context menu items are controlled from within the plugin and usually doens't require any coding by the skinner. Drir Wrote: Also is there any way that the api supports marking watched videos, for instance when you watch a video through the plugin right now it doesn't register on youtube that you have watched it. This could also be useful for subscriptions, because after watching the list depreciates. That being said, it would probably be wise to mark as watched after say 95% of clip complete. There is an api for this but the problem with it is that we have no way of knowing wether a user watched a video to it's end or just canceled playback, so in every case we would mark the video as watched without knowing whether that's actually true. For that reason im not fond of implementing what would at best be a broken feature :/ (I can already imagine the hordes of new forum posts complaining that it doesn't work right). kreach Wrote: The "more videos by" user feature also requires you to be logged in, which according to the docs, it shouldn't. Both the related videos and this stem from core.list() requiring being logged in, but listUserFolderFeeds() for the "more videos by" feature also requires being logged in. 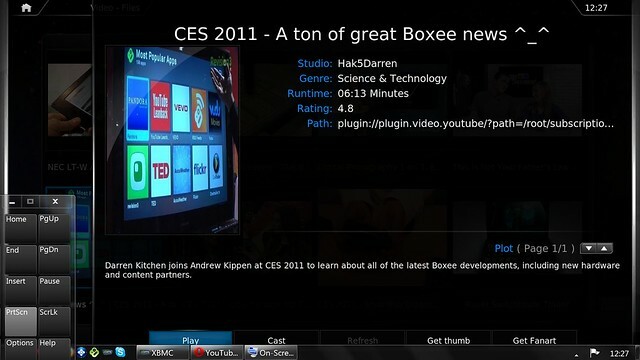 HenrikDK Wrote: The upload date should already be visible in the info dialog as part of the descriptions, xbmc's doesn't have a specific place for this info so we included it as the first line of the description instead. Thanks for the reply I appreciate it. I tried various videos, but I couldn't find the upload date on them. It might be to do with my xbmc build? (mine is pre the 10.0 release). However I do use the latest version of the plugin. I'm using the default skin, Confluence. I do love the plugin by the way, it's really something! cheers! No problem, everything else works great, so thanks for the addon. PantsOnFire Wrote: Thanks for the reply I appreciate it. I tried various videos, but I couldn't find the upload date on them. It might be to do with my xbmc build? (mine is pre the 10.0 release). However I do use the latest version of the plugin. I'm using the default skin, Confluence. I do love the plugin by the way, it's really something! cheers! Can log in with no problems, can see feeds and thumbnails on list of videos, but selecting any video just shows 'opening stream' then nothing. Can't work out why! Any advice guys?